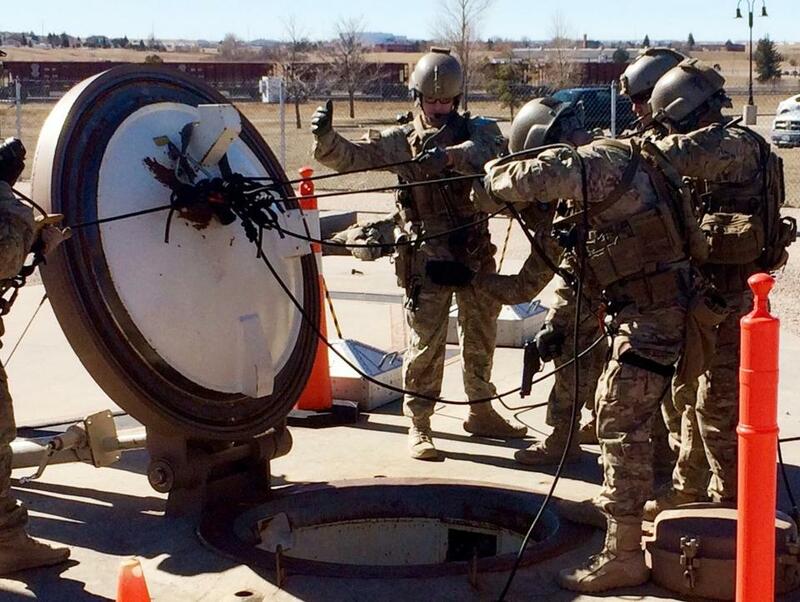 Members of the 790th Missile Security Forces Squadron demonstrate their training for recapturing a Minuteman missile silo after being taken over by an intruder/attacker, in February 2016, just days before the Air Force announced the drug investigation. ‘‘Although this sounds like something from a movie, it isn’t,’’ said Capt. Charles Grimsley, the lead prosecutor of one of several courts martial. The service members accused of involvement in the LSD ring were from the 90th Missile Wing, which operates one-third of the 400 Minuteman 3 missiles that stand ‘‘on alert’’ 24/7 in underground silos scattered across the northern Great Plains. ‘‘It’s another black eye for the Air Force — for the ICBM force in particular,’’ says Stephen Schwartz, an independent consultant and nuclear expert. In response to AP inquiries, an Air Force spokesman, Lt. Col. Uriah L. Orland, said the drug activity took place during off-duty hours. ‘‘There are multiple checks to ensure airmen who report for duty are not under the influence of alcohol or drugs and are able to execute the mission safely, securely and effectively,’’ he said. It’s unclear how long before being on duty any of the airmen had taken LSD, which stands for lysergic acid diethylamide. The drug became popularized as ‘‘acid’’ in the 1960s, and views since then have been widely split on its mental health risks. Although illegal in the U.S., it had been showing up so infrequently in drug tests across the military that in December 2006 the Pentagon eliminated LSD screening from standard drug-testing procedures. An internal Pentagon memo at the time said that over the previous three years only four positive specimens had been identified in 2.1 million specimens screened for LSD. ‘‘I absolutely just loved altering my mind,’’ he told the military judge, blaming his decisions to use hallucinogens and other drugs on his addictive personality. Harris was sentenced to 12 months in jail and other penalties, but under a pretrial agreement he avoided a punitive discharge. The lead prosecutor in that case, Air Force Capt. C. Rhodes Berry, had argued Harris should be locked up for 42 months, including nine months for the ‘‘aggravating circumstance’’ of undercutting public trust by using hallucinogens and other drugs on a nuclear weapons base. ‘‘I cannot think of anything more aggravating than being the ringleader of a drug ring on F.E. Warren Air Force Base,’’ Berry said at the courts martial. ‘‘I’m dying!’’ one airman is quoted as exclaiming, followed by ‘‘When is this going to end?’’ during a ‘‘bad trip’’ on LSD in February 2016 at Curt Gowdy State Park, about 20 miles (32 kilometers) west of Cheyenne, where F.E. Warren is located. A portion of that episode was video-recorded by one member of the group; a transcript of the audio was included in court records. ‘‘Minutes felt like hours, colors seemed more vibrant and clear,’’ Morrison testified. ‘‘In general, I felt more alive.’’ He said he had used LSD in high school, which could have disqualified him from Air Force service; he said that his recruiter told him he should lie about it and that lying about prior drug use was ‘‘normal’’ in the Air Force. Work, the deputy defense secretary, was there to assess progress in fixing problems in the ICBM force identified by then-Defense Secretary Chuck Hagel, who ordered an investigation after the AP reported on personnel, resource, training and leadership problems in 2013-14. Those problems included the firing of the general in charge of the entire ICBM force for inappropriate behavior the Air Force said was linked to alcohol abuse. A month later the AP revealed that an unpublished study prepared for the Air Force found ‘‘burnout’’ among nuclear missile launch officers and evidence of broader behavioral problems, including sexual assaults and domestic violence. Air Force officials say the force has since rebounded. In an interview, Work said he was not aware during his visit that anything was amiss. Nor was he briefed later on the investigation. He said he wouldn’t have expected to be briefed unless the Air Force found that LSD or other illegal drugs were a ‘‘systemic problem’’ for the nuclear force, beyond the security forces group at F.E. Warren. As the investigators closed in, one of the accused, Airman 1st Class Devin R. Hagarty, grabbed a backpack and cash, text-messaged his mother that he loved her, turned off his cellphone and fled to Mexico. ‘‘I started panicking,’’ he told a military judge after giving himself up and being charged with desertion.